Need a Vacation? Win a Summer Escape – or take $26,000 tax-free Cash instead! Published on June 7, 2018 at 12:00 am . Vancouver, BC, June 7, 2018 — As your reward for buying early, you could win tons of cash in this year’s Hometown Heroes Lottery! 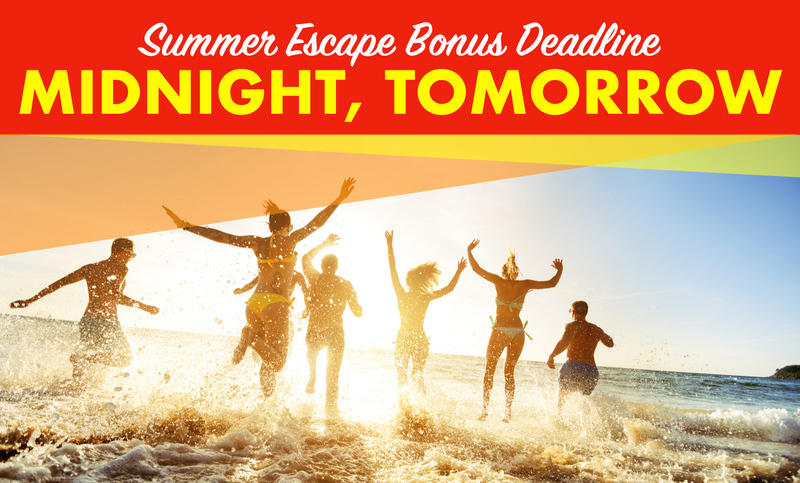 One ticket gets you into these huge prize draws – the $26,000 cash Summer Escape draw, the $105,000 cash Early Bird draw, and the $2.1 million cash Grand Prize draw. And don’t forget to order your 50/50 PLUS tickets, either – to win half a jackpot that could reach $2.2 million. And all of this cash is tax-free… this could be the year you become a multi-millionaire! Paris or Barcelona. Guess what? You don’t have to choose! Winner gets a 19-day South of France trip, with a Paris/Barcelona cruise – and $5,000 spending money. These are two of the most magical, romantic cities on earth. Treat your sweetheart to the getaway of a lifetime with a Summer Escape to the best of Europe! Or choose the car – a 2018 Honda CRV. Or take $26,000 tax-free cash instead! Spend it as you please, as you wish. Treat yourself to a terrific summer of your own design. And don’t forget about the massive Early Bird prize, either! Order today and you’re also in to win the $135,000 Early Bird Draw – choose a brand-new 2018 Tesla Model X, a $120,000 travel package, or $105,000 tax-free cash. Win your way into B.C. real estate. Become a multi-millionaire. Your dream home is only a winning ticket away! This year’s largest Grand Prize package is worth over $2.6 million! This year’s Grand Prize winner will choose 1 of 6 home packages – a modern masterpiece in Crescent Heights (South Surrey), a family retreat in Ocean Park (South Surrey), a city living condo in Vancouver, an Okanagan paradise at Lakestone (Lake Country), an oceanview cottage at SookePoint (Vancouver Island), or a breathtaking Skaha Hills home in Penticton. There’s a choice for everyone, for every lifestyle! Or choose everyone’s favourite prize, the most versatile prize of all – $2.1 million tax-free cash! It’s a Win-Win. When you play, you can win. When you play, you’re helping those who need it. The prizes are great; the cause is vital. Win Over 1.8 Million in Prizes with Stampede Lotteries!